Oh my, what an ambitious undertaking this was. 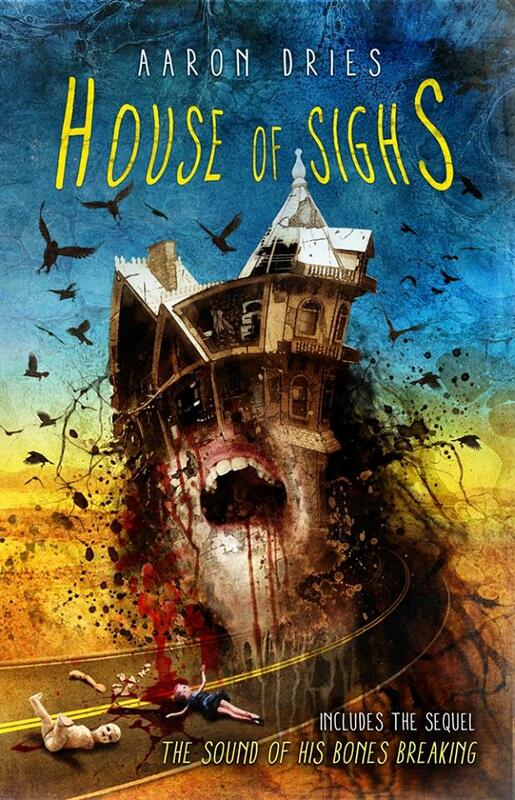 House of Sighs dashes the hopes of a happy ending right from the get-go. A story told in reverse you already know how it will end but how they got there is one you’ll never forget. Aaron Dries sets the mood with the very first sentence “Suzie Marten was ten years old when she died.” it all goes downhill from there. The story revolves around Liz Frost, a young woman with many hang-ups and even more secrets. One morning she decided to end it all instead she went to work. Too bad… the town of James Bridge just may have gone on blissfully unaware of the catastrophes that can strike at any time. In what can only be described as a psychotic breakdown Liz has a plan to change the course of her life. Driving a city bus, she goes along her route picking up her passengers unbeknownst to them that they are to be a part of her new family. One passenger at a time we learn of their own troubles. Dries digs deep to give us the scoop and you really do begin to feel sorry for the lot of them. Oh, if they only knew their problems are minuscule when compared to what lies ahead. When Liz has enough people aboard for her new family she drives the bus home by now the passengers are panicking knowing something is terribly wrong with their driver. The petty bickering amongst the passengers begins as soon as the realization sets in that they are in trouble takes hold. Perhaps, things may have turned out differently if only Liz didn’t go home. Perhaps, if the passengers had worked together in reaching out to Liz she might have come back to reality. Perhaps, perhaps, perhaps…. Ah, but then we wouldn’t have had a story of this magnitude. Utterly brutal! The bonus novella, The Sound of his Bones Breaking continues the story and its horrific aftermath. Scars run deep and some never heal. “Eat the part that hurts, said the voice of the flies. Aiden and Danny have been in a relationship for a while now. Although, it isn’t always an easy one they do seem to be happy. That is… until one night while out on the town they get entangled in a drunken altercation. That night was a turning point for Danny, all his old fears that he has worked so hard to bury have been awakened. Aiden is clueless to Danny’s buried secrets and in a bid to help get Danny back to his old self he invites Danny to join him in Thailand where he has a job offer. Poor Aiden, little does he know that Danny will never be the same. Left alone in a strange country while Aiden works, Danny begins to slide backwards into his self. Madness takes over and all Aiden can do is stand by helplessly and watch as the demons so carefully hidden resurface. If you could only read one book this year, this should be the one! Dries has done an excellent job of fleshing out his characters and has given us people to care about, to love, to hate, he has made them real. Laid out beautifully in all its horrific detailing this story will stay with you for a long time. Oh, and that cover? That is Ben Baldwin’s work! Grab your copy HERE! !